Manage multiple campaigns including SEO, search, display, and email marketing to drive traffic to your e-shop and increase conversions. 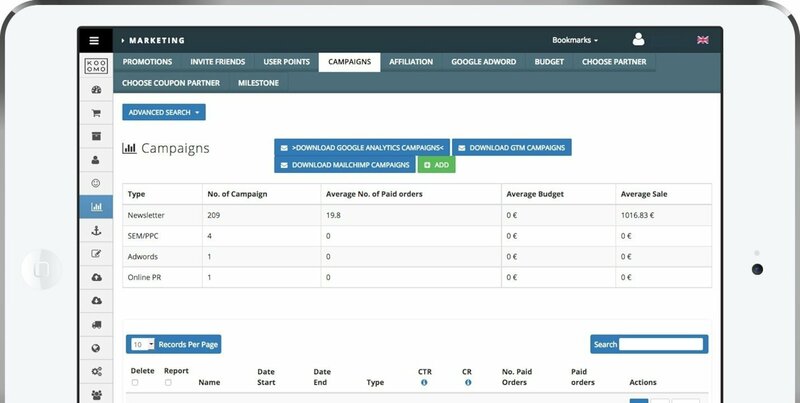 Run multiple campaigns using our network of over 200 API integrations across the categories of email, SEM, display advertising, social media, retargeting, and much more. You'll also have access to our global network of creative agency partners who can work with you to optimise your digital marketing campaigns for maximum impact and return. Our built-in SEO and digital marketing tools enable users to generate meta-tags, import and export product tags, and create user-friendly URLs. You can also easily run reports to detect any broken or weak URLs, ensuring that your website is fully optimised for search at all times. The Kooomo digital commerce platform has a built-in CMS, enabling users to integrate a blog into their digital marketing mix. Hook your target audience with engaging content, which will also give your email marketing campaigns an extra layer of added value.